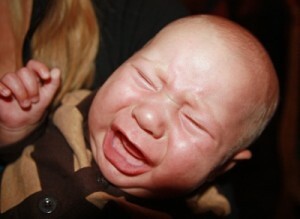 Did you know that on average, a newborn baby cries between one and four hours per day? That’s a lot of hours, and they add up! 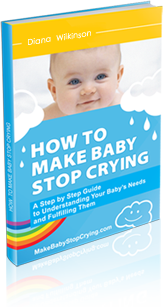 This article offers a few suggestions for how to stop a baby from crying. First, you’ll want to rule out the basic physical needs, like hunger and dirty diapers, as causes of the crying. These are some of the easier things to check: offer food and inspect the diapers. Sleep is also a basic physical need, yet if you put your child down in his crib, he may not stop crying even if he is exhausted. Try holding your baby close, rocking, or singing a soothing, calming song in a darkened room. There may also be small irritants that are causing discomfort, or she may be too cold, too warm, or need to belch (especially after eating). Stomach aches are especially troublesome for babies. All babies like to be held close, since they can hear the reassuring sound of their parent’s voice and even their heartbeat. For very young infants, swaddling might also help stop the baby from crying. Babies also love movement. This could mean rocking your baby, but sometimes being carried from room to room in the house satisfies them in a way that being held in one place and rocked does not. For decades now, parents have also found that putting their child in the car and driving around is sometimes very successful in getting a tired, crying baby to sleep. Emotionally, babies need to feel a strong bond with their parents or caregivers. And almost all children experience some form of separation anxiety, beginning when they are only a few months old. So if you have been in the other room for a while or away for the day, then your baby may simply be crying because she misses you and wants to have you close. Psychologically and mentally, babies need things to look at and things to do. Toys, a change of scenery, talking to your baby or even making funny faces may give your child the engagement she needs. On the other hand, however, babies can also get overwhelmed with too many sights, sounds, or people. In that case, moving them to a quieter place may work wonders. Many babies, whatever the cause of their crying, respond well to white noise, like a fan, vacuum cleaner, or even being set on the floor by the washing machine. Some babies may also be comforted by sucking on something (like a pacifier or even your clean finger), even when they’re not hungry. One thing to keep in mind is that some babies simply cry more than others. Some babies are very frequent criers—and if that’s the case for your baby, you may be wondering, “When do babies stop crying, anyway?” Take heart in the knowledge that, even if your baby is a heavy crier, eventually she will begin to use words to express herself and the crying will diminish!